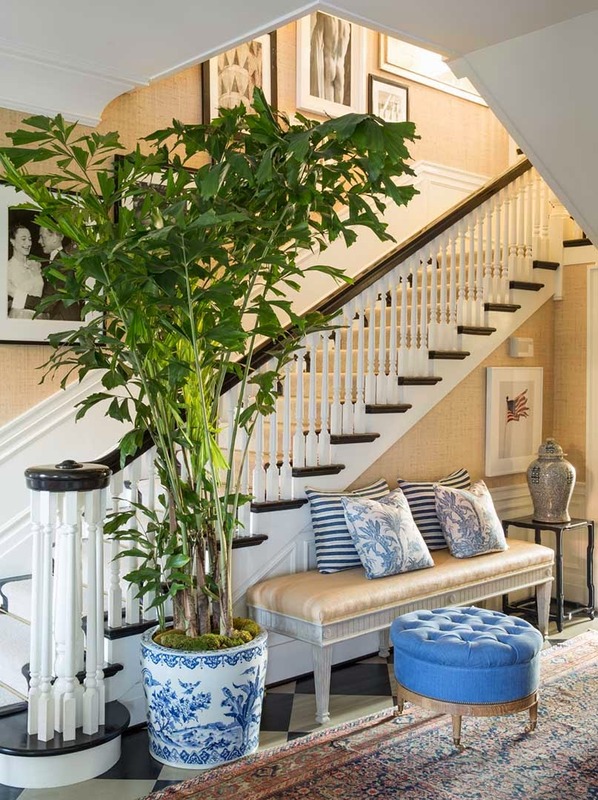 HOUSE PROUD: Dave DeMattei and Patrick Wade, partners for thirty years, have directed and infused style into leading international interior design and fashion and style companies over the last three decades. In New York and San Francisco, they were associated at the highest levels with companies like Coach, West Elm, Gap’s Banana Republic, J. Crew, Williams Sonoma, and recently at Lucky Brand. The couple, youthful and great company, have been involved in all the superhot style companies when new ideas were introduced, new directions taken, and new styles and designs and concepts pushed forward. Patrick is an interior designer at heart, designing furniture, planning retail stores around the country, creating product and giving style companies a chic, classic style. Dave is a fashion retail executive. 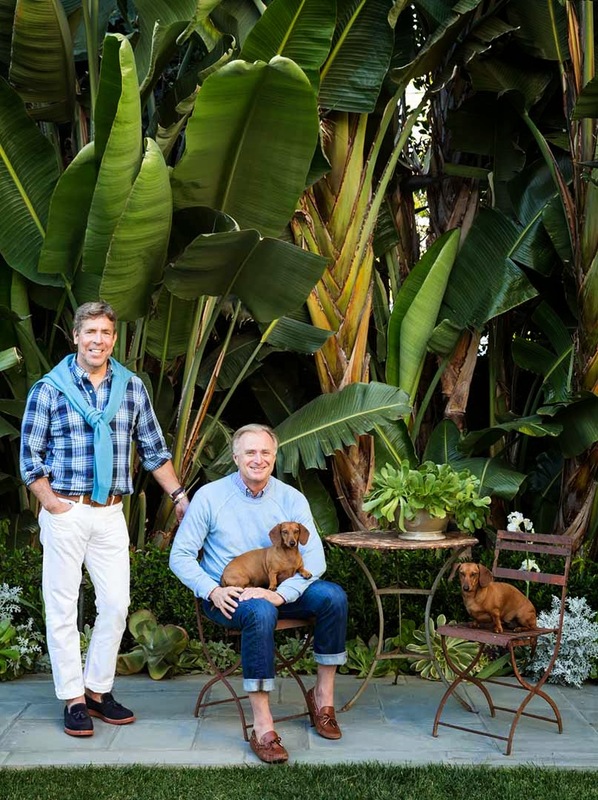 Patrick Wade and David DeMattei and their dachshunds in Beverly Hills. 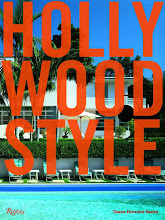 Now the two men are living in Los Angeles, and their classic Beverly Hills flats house, recently completed, is the distillation of their personal style. 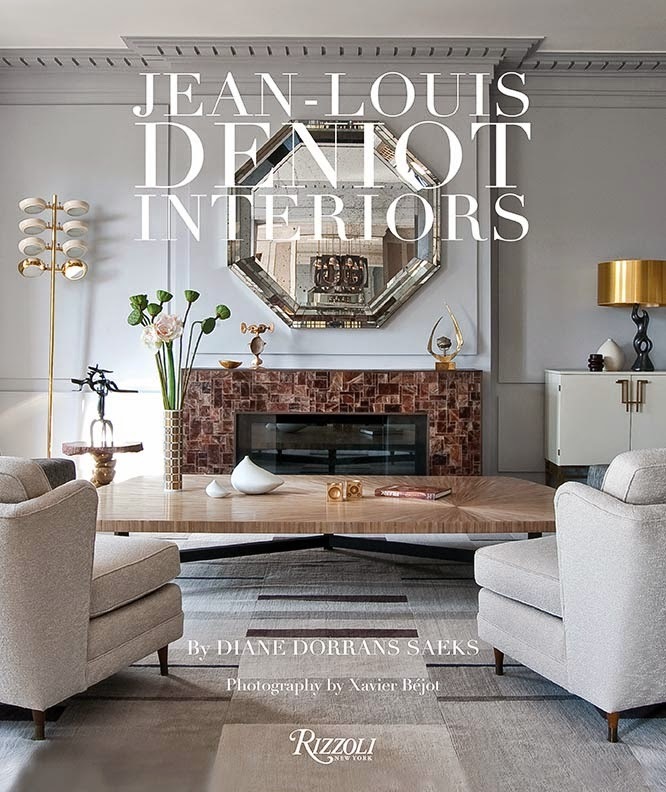 It is, they say, their ‘big edit’ of more than a thousand pieces, with their favorite paintings, black and white photography, sculptures, books, furniture, fabrics and ravishing collections making the cut and shown in all rooms. Come with me for a visit, meet Dave and Patrick, and their two elegant dachshunds…and be inspired by their paint choices, their fabrics, their classic silhouettes. 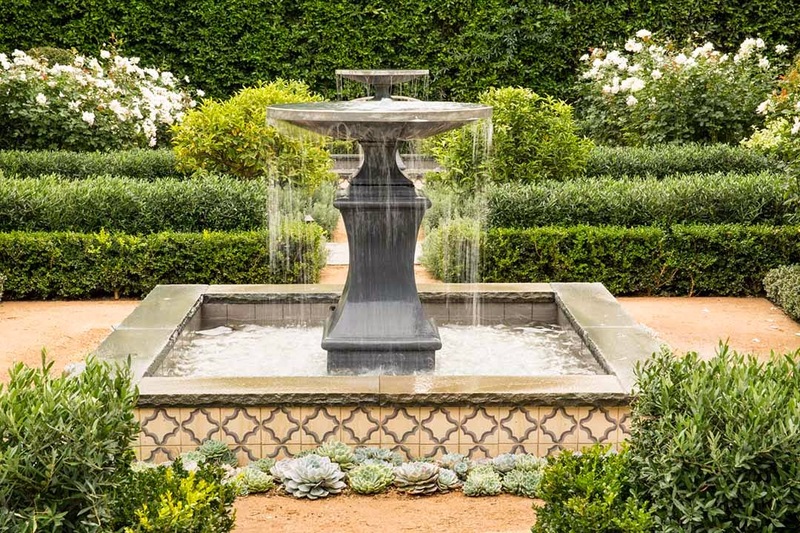 Above, the new garden in monochromatic tones of green and white frames the house. For the living room Patrick wanted a tailored look, anchored by low, comfortable sofas. 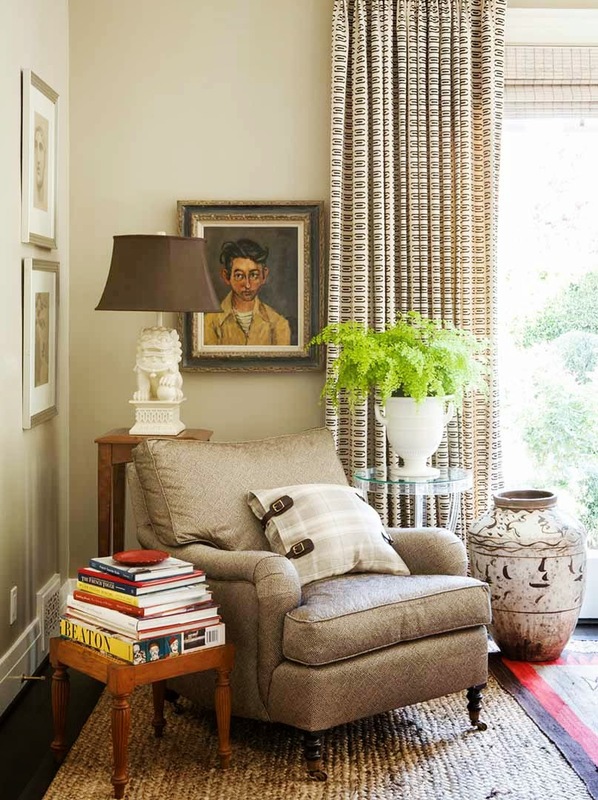 He dressed up the room and added texture with George Smith curtains, John Robshaw pillows, and collections found on their worldwide travels. Design note: the original crown molding is 15-inches wide, which adds a sense of height, heft, and architecture, said Patrick. The wall paint is ‘Old White’ by Farrow & Ball. 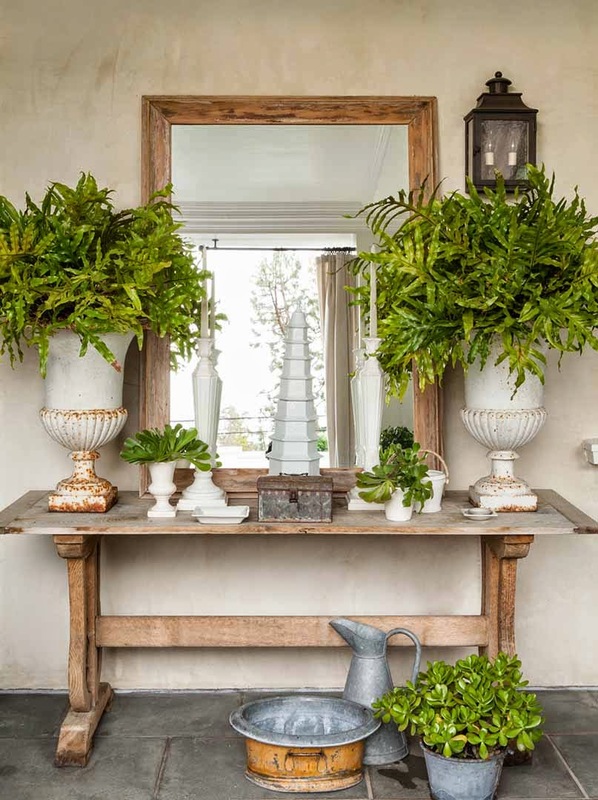 “I created the entry foyer as a room, a moment, with an iron table from Guinevere, London, floating in the middle. 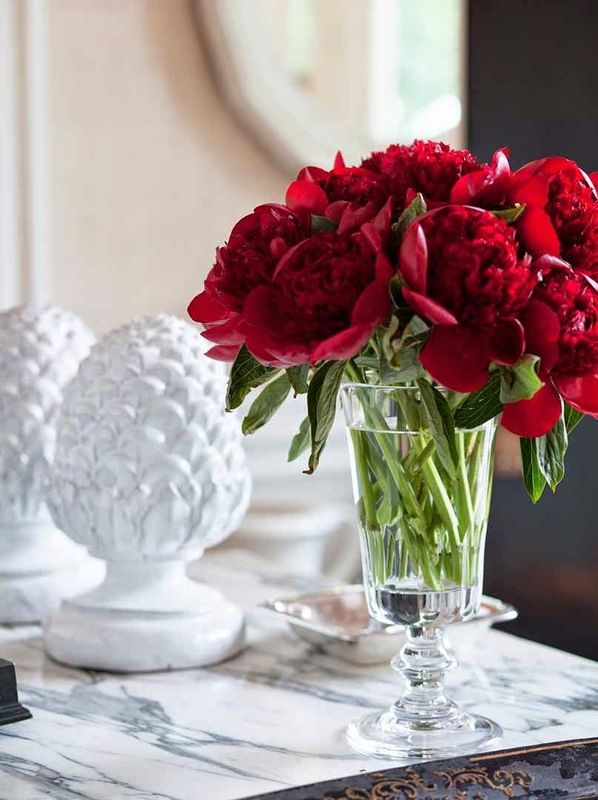 We change the collections and sculptures quite often, and always have fresh flowers to welcome us home,” said DeMattei. The floor was stenciled in a diamond pattern. Patrick and Dave have collected black and white photography for thirty years. 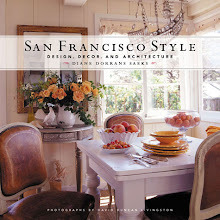 I’ve known Patrick Wade and Dave de Mattei for ages, and I’ve always admired their style, their collections and their in-depth understanding of California casual mixed with East Coast classicism. 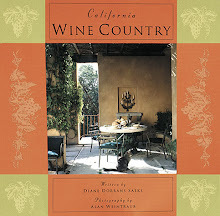 I’ve written about their residences in San Francisco and a house among vineyards in St. Helena, in my books. 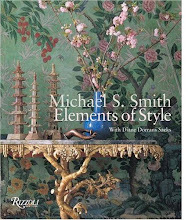 They were all eminently photogenic and very editorial in approach, and wonderfully styled with contemporary oil paintings, antiques, Hermes blankets, shagreen boxes, and stacks of books. They love nothing more than flea marketing on a Saturday, in London, Paris, New York or Tokyo. Many favorite pieces are trophies from travels. 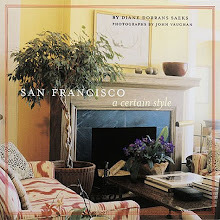 For more than thirty years they have been deeply immersed in their professional lives in New York City, and San Francisco. They lived in a spacious loft in SoHo, and on Friday evenings headed for Southampton to relax in their classic saltbox house not far from the beach. The two men acquired a handsome Edwardian house in the Upper Haight neighborhood in San Francisco, planning to eventually return to San Francisco. Finally, they headed back to California, and acquired a house with twelve acres of garden and vineyards on Napa Valley’s western edge, the highly regarded region known to winemakers and growers as the Rutherford Bench. 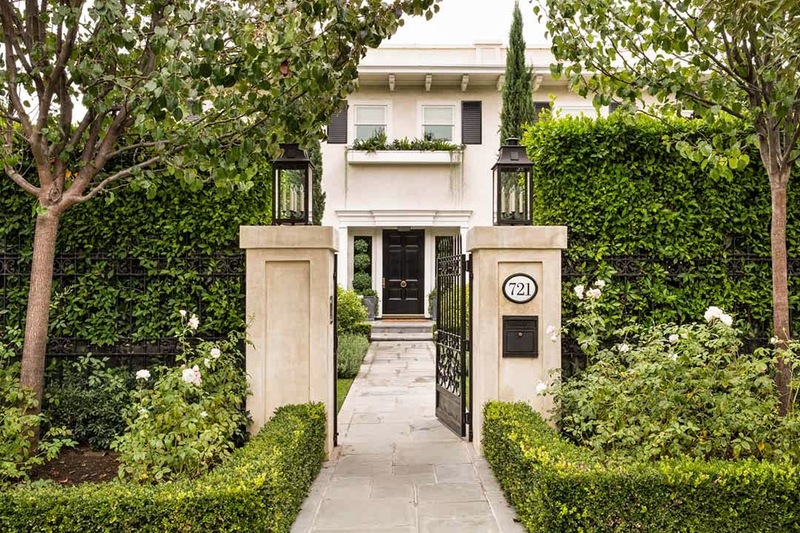 They sold the San Francisco house and the Napa Valley property—and have edited collections down to classic favorites for the LA house. “The study is one of our favorite rooms in the house because it’s small, intimate, and has a cabinet front that disguises a TV,” said Dave. 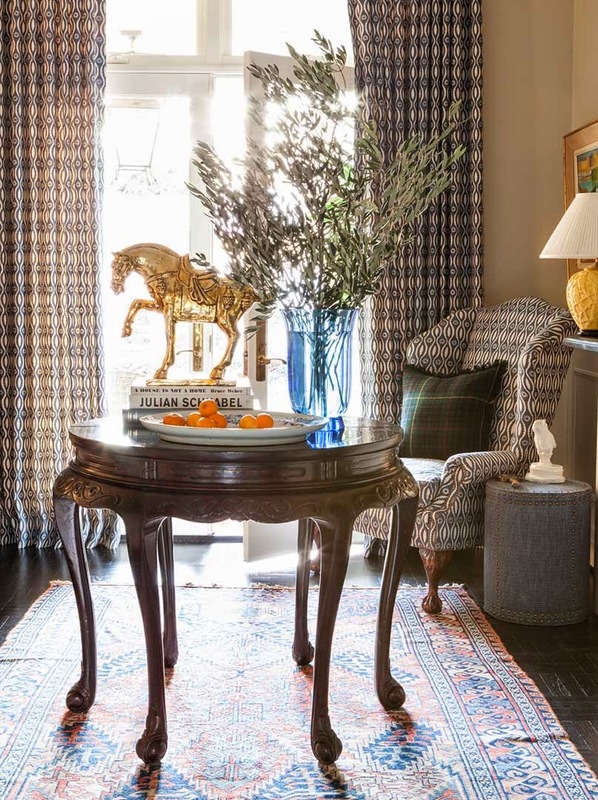 “The room is very casual, and we’re surrounded with books.” The trunk/table was custom made by Guinevere. Design note: Lamps are from Ann Morris, New York. 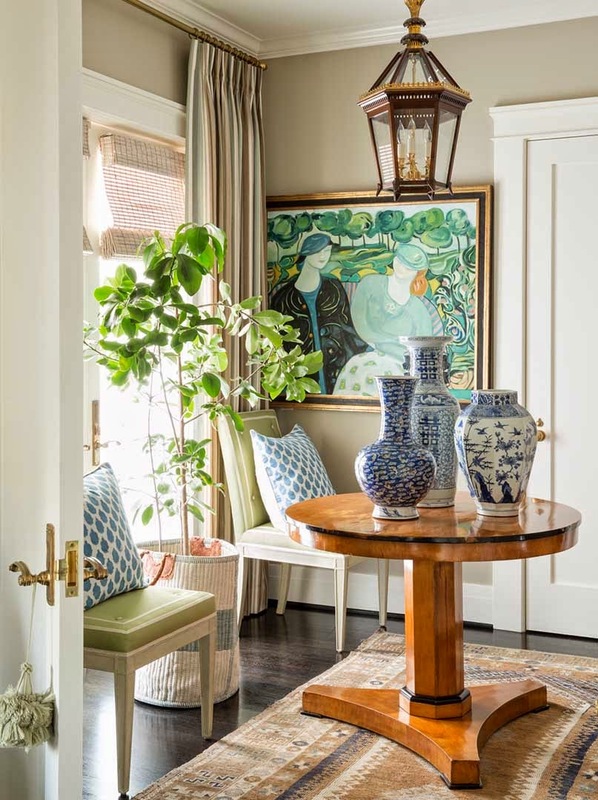 The rug is by Madeline Weinrib, custom-crafted. 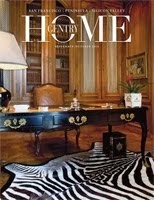 The living room rug is also by Madeline Weinrib, New York. 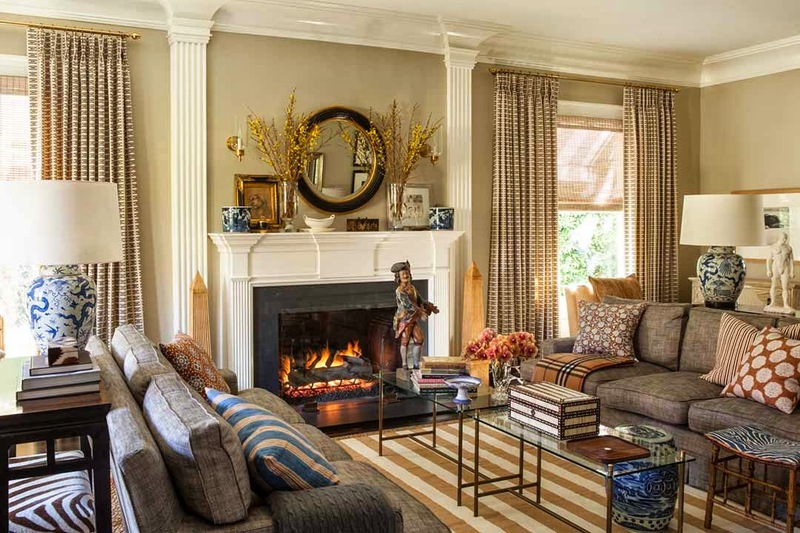 Patrick was taken by the confident outlines of crown moldings, a series of large windows in the living room, handsome mantels, and a clssic floor plan that worked. Downstairs are a gracious living room, and a large dining room room. Upstairs are two bedrooms, a cozy study where they watch television, guest quarters, and an office. 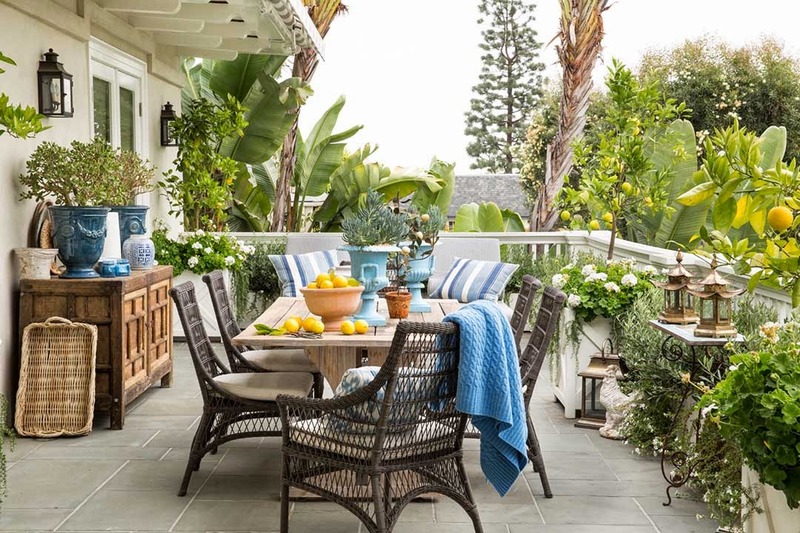 The sunny kitchen overlooks a brick terrace and a garden planted with agapanthus, hydrangeas, jasmine, and roses. White of course. With the walls painted a rich cream, and floors refinished and covered in practical leather-bound sisal rugs, the partners were ready to move in. 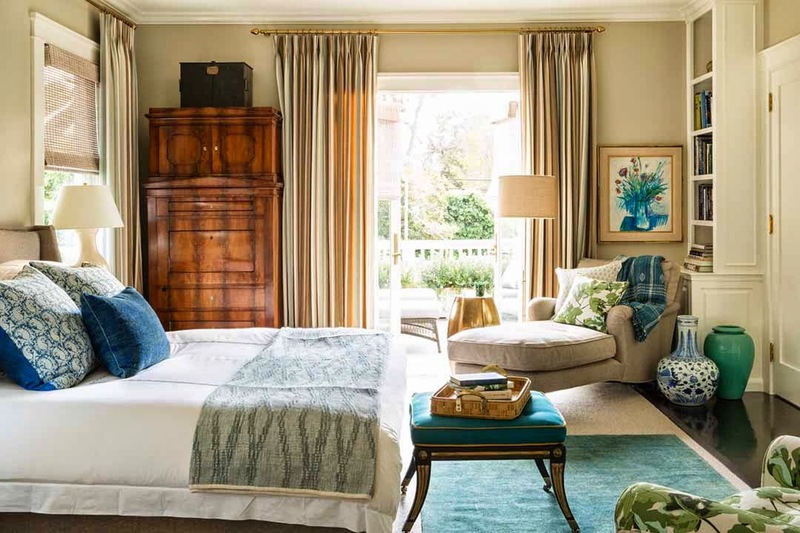 “The bedroom overlooks the garden and it always feels light, airy, private, quiet,” said Patrick. 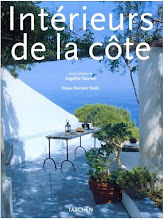 “In the morning we often have breakfast on the terrace. Design note: Walls are painted ‘Old White’ by Farrow & Ball. The fabric on the chair, right foreground, is by Peter Dunham. The large Biedermeier cabinet was acquired almost thirty years ago, and has followed them from house to loft to the LA residence, always adding a sense of stature to their rooms. 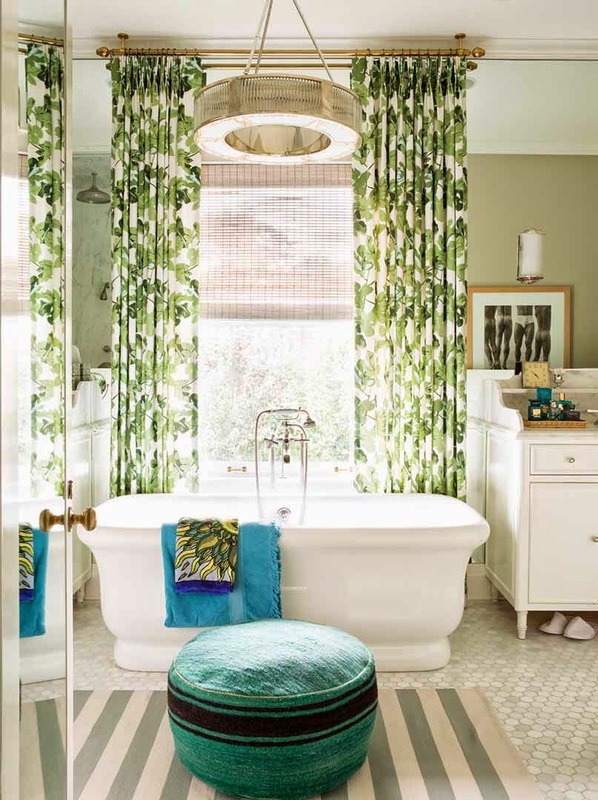 Design note: Curtain fabric in the master bath is by Peter Dunham, Los Angeles. 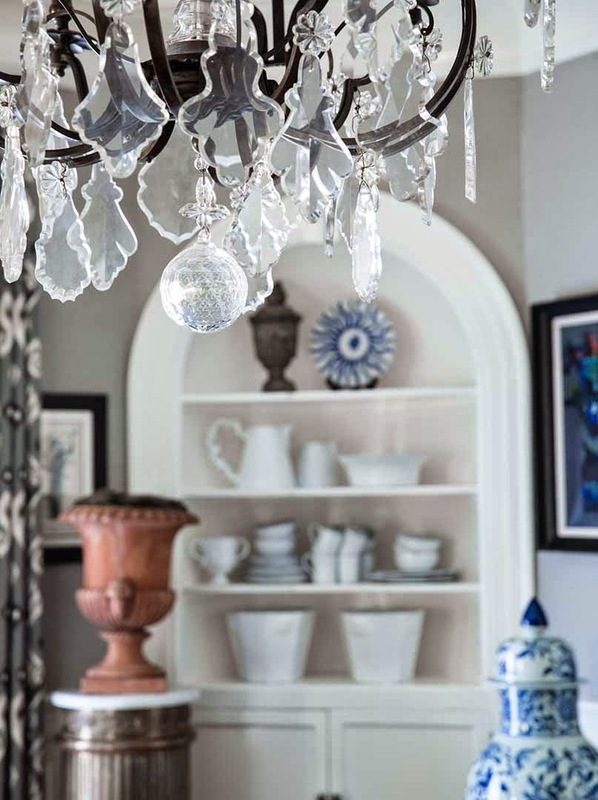 This time around Wade wanted a lighter, more eclectic approach to the rooms. "The scale of the rooms asked for larger furniture, and bold shapes,” Patrick noted. 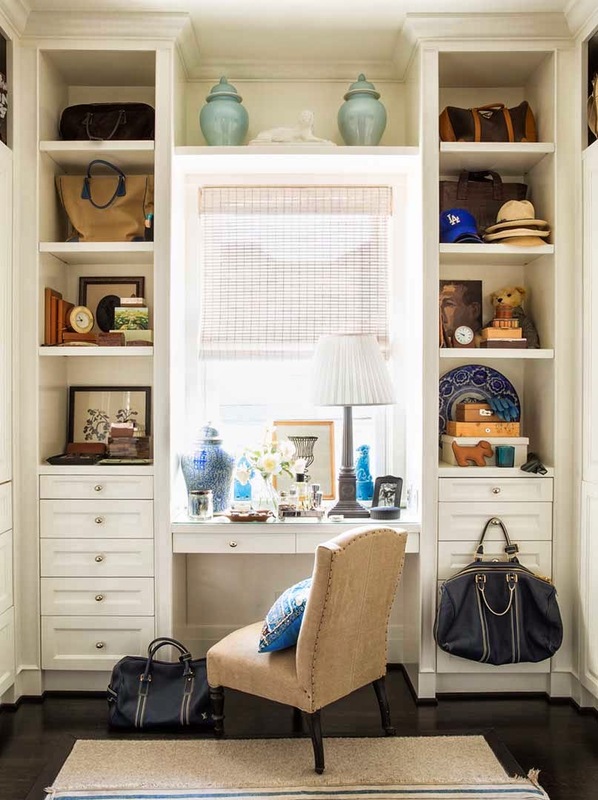 “I anchored each room with classic, comfortable chairs and sofas, and surrounded them with useful tables so that the rooms feel settled, well-organized." The breakfast room, with its bright new attitude and sculptural chairs has become an all-purpose gathering place, a study, and an informal dining spot. 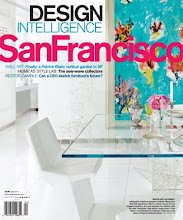 Weekends, Wade and DeMattei like to linger around the table over lunch and the latest design magazines, and The New York Times. 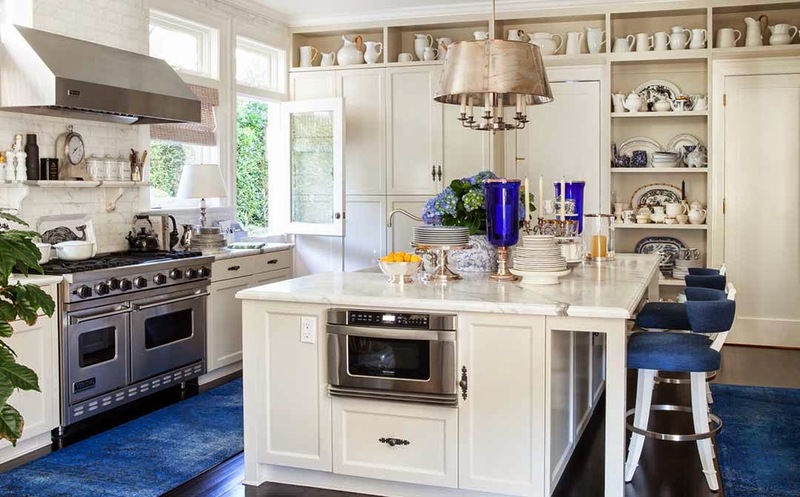 The kitchen, which overlooks the garden, was remodeled from floor to ceiling. 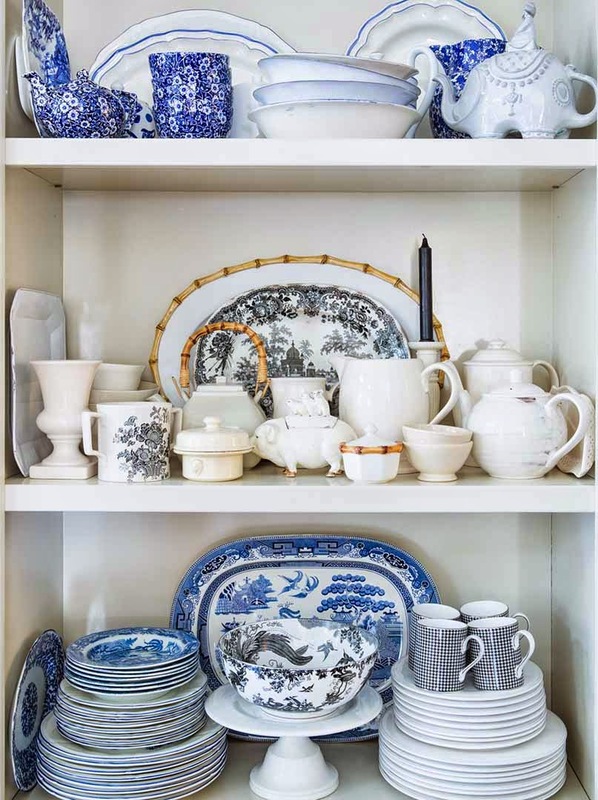 Wade removed old wall cabinets in favor of open shelves where he displays his superbly edited collections of English pottery, Astier de Villatte platters and bowls (from Sue Fisher King), along with antique pitchers found in Paris and London. The kitchen and breakfast room are framed in crisp white. 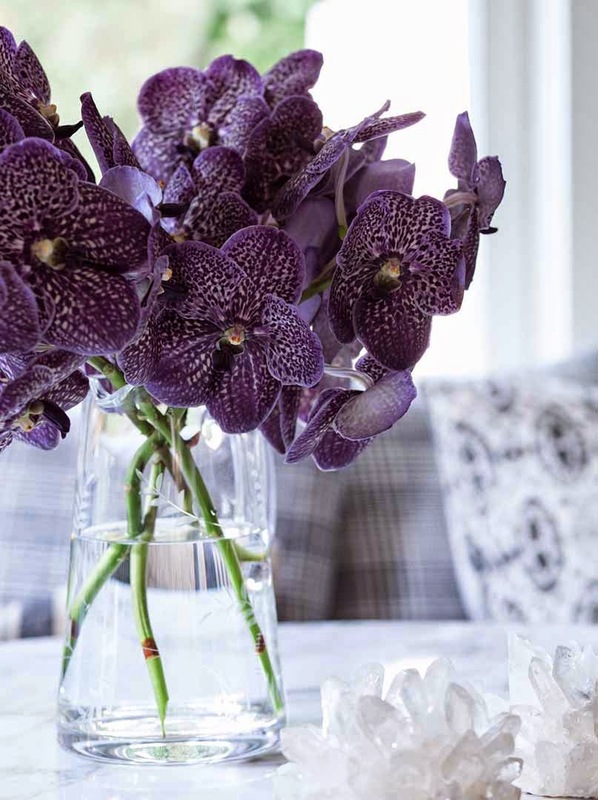 Surfaces, countertops, are ideal for creating tableaux of collections, flowers. 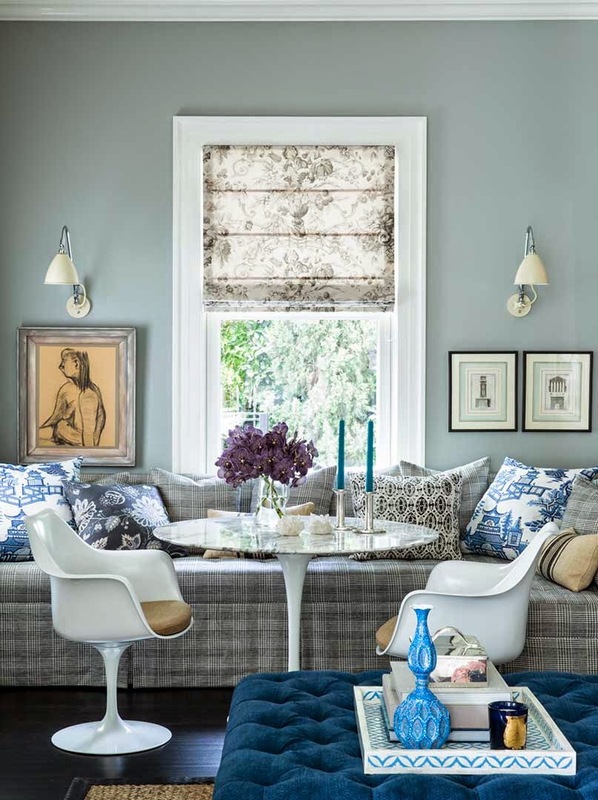 Walls are one of Farrow & Ball’s pale grey tones. Kitchen cabinets are painted in ‘String’ by Farrow & Ball. "It's all in careful editing and placement and getting the background right,” Wade said. 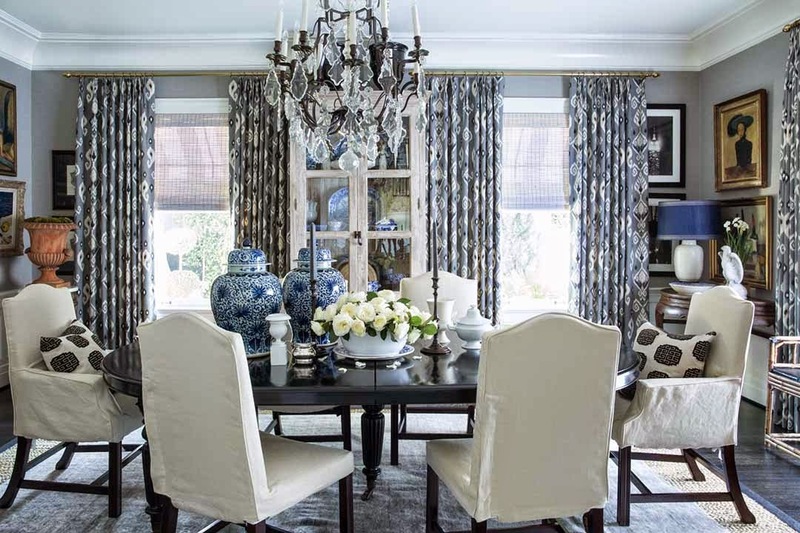 “Silhouettes of each table and sofa are crisp and bold. I did not want the rooms to look jumbled or fussy. Each sculpture and object and photograph should be beautifully presented so that you can really appreciate it." 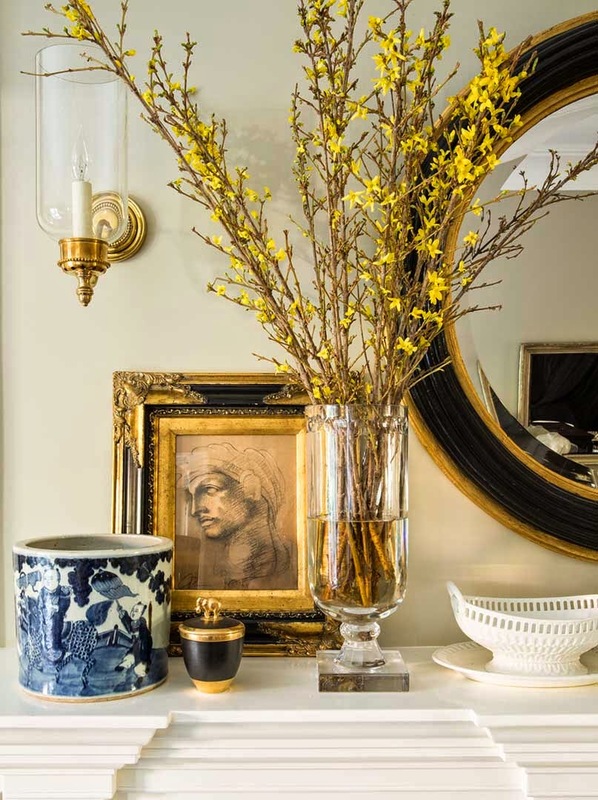 The couple love black and white photography, antique boxes, vintage textiles, estate treasures, and quirky paintings. “It looks like a lot, but this is a distillation, and we spent months editing and refining,” said Patrick. The Edwardian aura has been muted, and the house now feels less a period piece and very much centered on their busy lives. 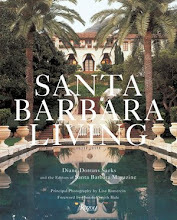 Lisa Romerein is an exceptional and admired photographer who has worked for a range of elegant luxury publications including C magazine and House Beautiful, Santa Barbara magazine, and many others. 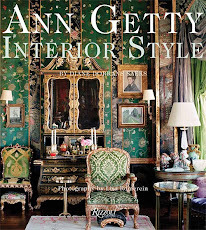 Lisa was the principal photographer for my recent design book, ‘ANN GETTY INTERIOR STYLE’ recently published by Rizzoli. 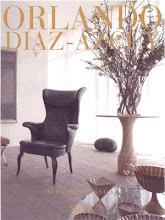 Diane I am in awe and almost overwhelmed with this most gorgeously curated home. Patrick and David have collected the best of what they love and it shows! What a stunning home, and a wonderful post (photos, details). 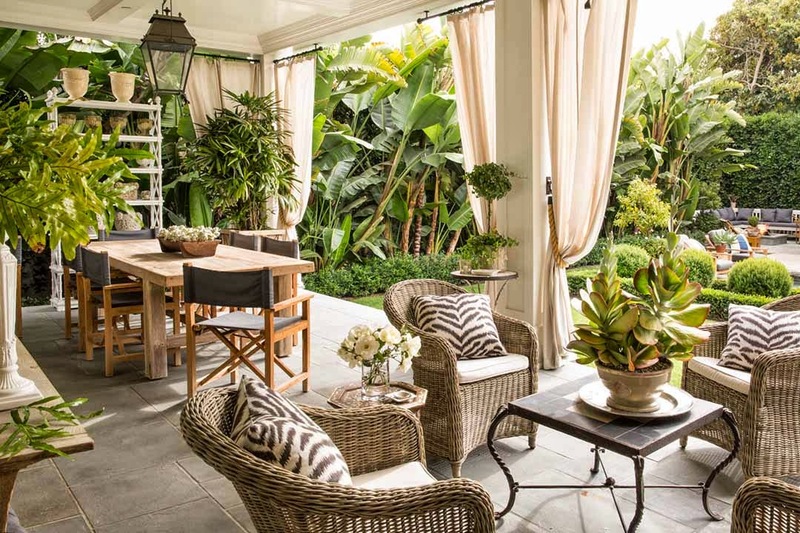 Their home combines the best of a casual traditional style with the lightness of contemporary design. Its been quite a while since I saw a home I thought was so beautiful as well as live able. I think that the couple did an excellent job at blending the new with the old. The result is clean, crisp, fresh, and, most important, comfortable. Really beautiful. 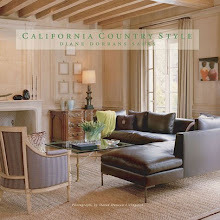 Diane, thank you for treating us to this lovely house tour! Diane, such a beautiful post as always. Thanks for setting such a high standard in blogging. I've seen some of the paintings and photography in their three or four houses…and now in LA…this is their final edit, they say. "Great piece. Very relatable and good ideas to take for my home. 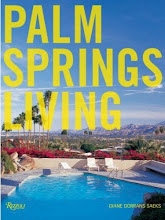 Having lived in both Santa Monica and Beverly Hills, and now in Northern California, I understand wanting to live in both places!" I've had a great response to this post…everyone can pick up ideas, color inspiration, concepts.
" I write to say that this is another lovely article, Diane. " So chic. 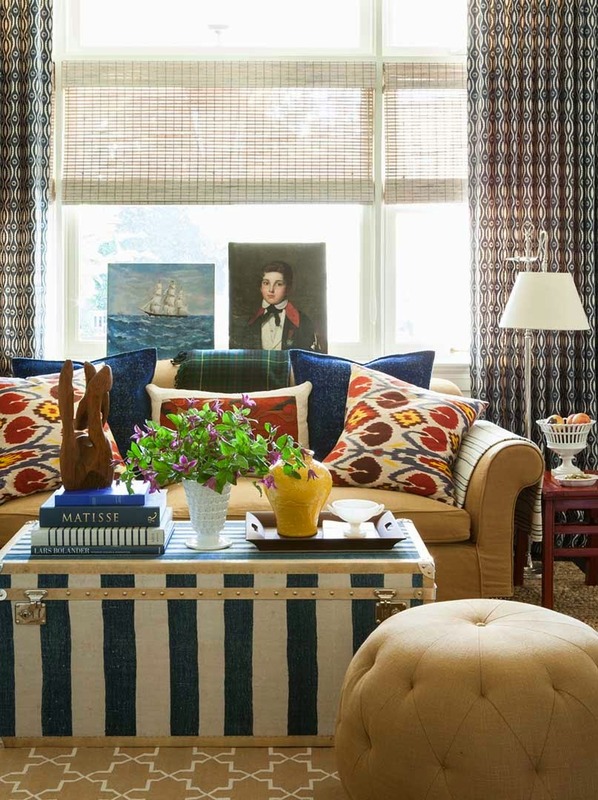 I love the layering , collections and various shades of color. I'm impressed by the fact they have true style ! Stunning, Diane. I was completely taken in by the lovely, warm interiors. Then, when you took us to the gardens, pool and exteriors, i was complelely in love. 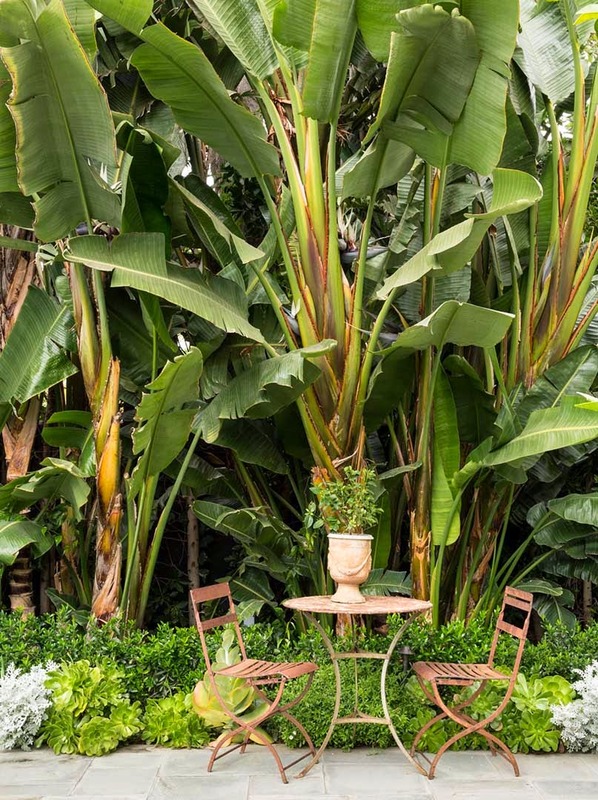 They have created an oasis in Los Angeles that embraces the charm of the past with the ease and clean lines of the present day. Thank you so much for this amazing post! You are right that it is an oasis, a retreat. They love it. 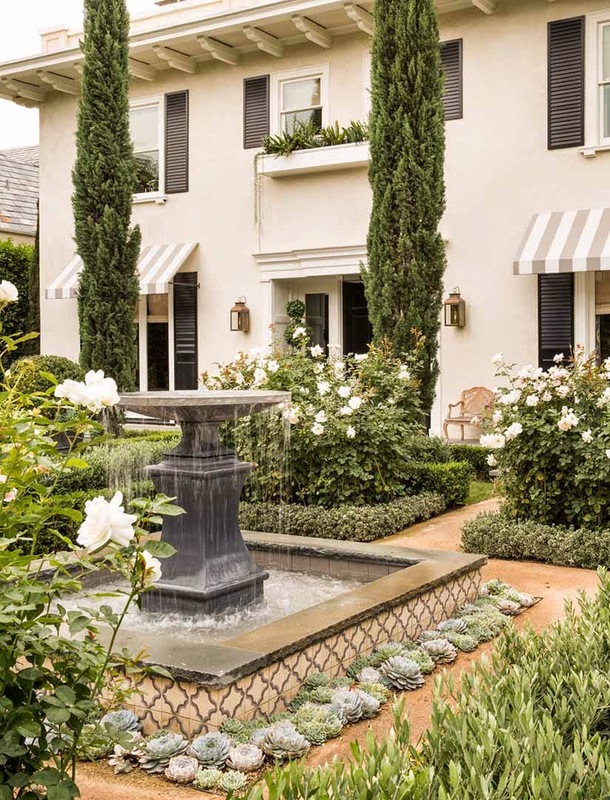 Note that the house is five minutes approx from Rodeo Drive…and yet it feels like an escape. Dave and Pat told me that a lot of people ask them if they are going to get a house at the beach…and they say, 'why would be go to the bother of driving to the beach…when we have our own weekend escape her…we don't want to leave'. 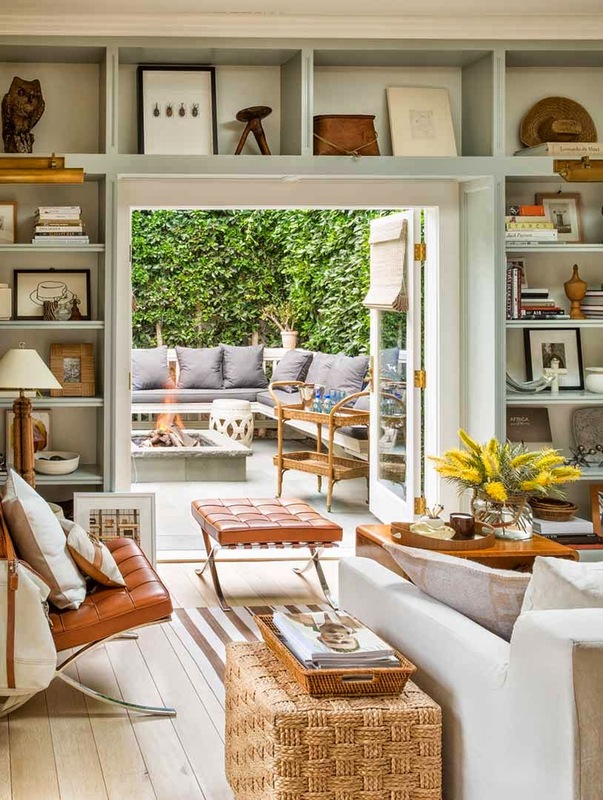 I've had great response to This house…partly because it's personal and relaxed, but also because readers can see themselves watching tv or dining or swimming or eating breakfast and reading the paper or sleeping or entreating…with their dogs nearby. kindest thanks for your beautiful observations.